Archives for April 2014 | Khelmart.org | It's all about Sports. Whey Protein is a commonly known health supplement and very popular among in body builder and athlete community. Its Provide pure protein which helps in building muscle s and stamina. Protein consists of amino acids which gives quick muscle tissues recovery. ON 100 % Gold Standard consists of 24 gms of pure protein isolate per serving. It will provide you optimum level of amino acids which is very essential for quick muscle recover (during workout our muscle tissues get damage). It is prime source of pure whey protein without adding fat, cholesterol and lactose. If you check the cost per serving then On Gold standard is far good as compare to other brand health supplements. 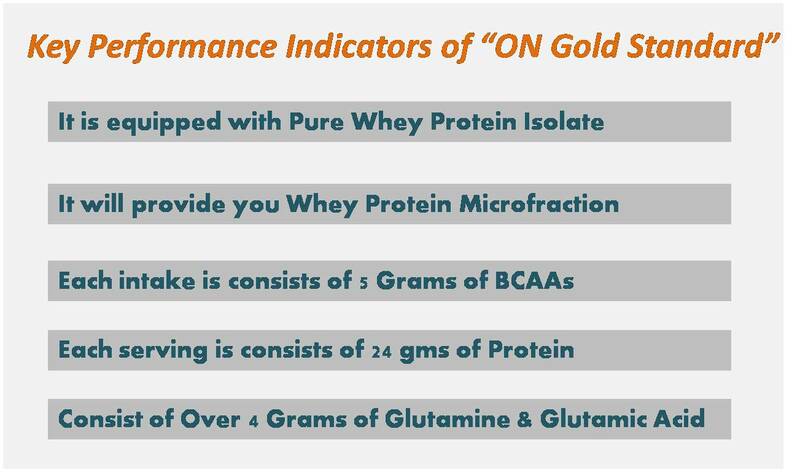 ON 100 % Gold Standard Protein will provide you 100 % pure Protein isolate with low fat level. With these quality and effective amount of protein per serving, ON Whey Gold standard is cost effective whey protein supplement available in market. Ultimate Nutrition ProStar consists of 20 essential amino acids which give better whey protein. These Proteins are easy to digest and give fast muscle tissues recovery. It is consists of all essential nutrition included immune enhancing factors from whey protein. It is processed with a specialized method which gives super fine whey protein for good health. Checkout whey Protein Online in India. Whey Protein is an important health supplements for athlete and sportsman. It’s give you fuel, energy and helps in building stamina and muscle. Whey Protein consists of Amino Acids which help in recovering the muscle tissues damaged during workout. Whey Protein helps in developing bigger muscle. Ultimate Nutrition ProStar Whey Protein consists of 20 essential amino acids which give better whey protein. These Proteins are easy to digest and give fast muscle tissues recovery. It is consists of all essential nutrition included immune enhancing factors from whey protein. It is processed with a specialized method which gives super fine whey protein for good health. In one intake of Ultimate Nutrition Prostar (intake size of 30 gms) will provide you 25 g of pure protein. On other hand it will give you 120 cal and 1 g of fat. Body Builder and muscle trainer can use Ultimate Nutrition Prostar whey Protein daily as three serving (In a day ). 8oz of water or milk in a blender. If desired, add fruit, peanut butter, yogurt, or ice cream. into 8oz of water or milk in a shaker cup. Shake for 25 – 30 seconds. into 8oz of water or milk in a glass. For a thicker shake, mix into 4oz of water or milk. Ultimate Nutrition Prostar 100% Whey Protein is instantized so it will mix easily with a spoon. Whey Protein is the byproduct obtains during processing of cheese. Based on processing and amount protein, different type of whey protein is classified. Whey Protein concentrated is the base type protein and have minimum amount of protein in it. Whey isolate is the refined form while whey hydostate is the finest form of protein available in market. ON 100 % Gold Standard Whey Protein consists of 24 gms of pure whey protein isolate per serving. It will provide you optimum level of amino acids which is very essential for quick muscle recover (during workout our muscle tissues get damage). It is prime source of pure whey protein without adding fat, cholesterol and lactose. If you check the cost per serving then On Gold standard is far good as compare to other brand health supplements. ON 100 % Gold Standard Whey Protein will provide you 100 % pure Whey Protein isolate with low fat level. 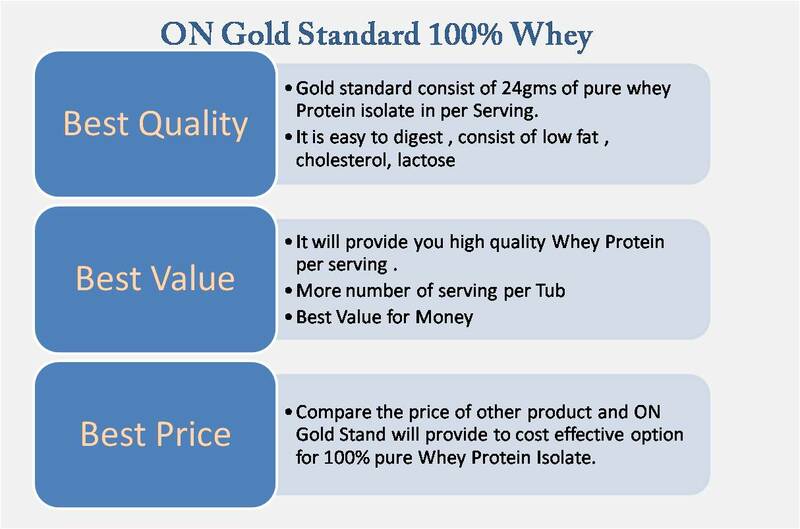 With these quality and effective amount of protein per serving, ON Whey Gold standard is cost effective whey protein supplement available in market. Each intake is consists of 5 Grams of BCAAs. Each serving is consists of 24 gms of Protein.